Thousands flee Eritrea's brutal dictatorship every month for Europe. Eritrea was the fourth-most common country of origin for refugees reaching Europe in 2015, after Syria, Iraq and Afghanistan. In this 2011 photo, a refugee boat approaches the Sicilian island of Lampedusa. The historic tide of people braving the journey to Europe in the past year has refocused the world’s attention on wars most of the refugees are fleeing -- in Syria, Iraq and Afghanistan. But after these three countries, the largest group of people fleeing to Europe last year hails from a small African nation that gets much less international attention. Eritrea is a totalitarian state, ruled by the country’s first and only president, Isaias Afwerki. Few outsiders are allowed to see what goes on inside its borders. But those who have escaped tell harrowing stories that include indefinite forced conscription, prison camps and widespread torture. A United Nations commission report last year, based on interviews with over 500 people who had fled the country, said the regime may be responsible for crimes against humanity. 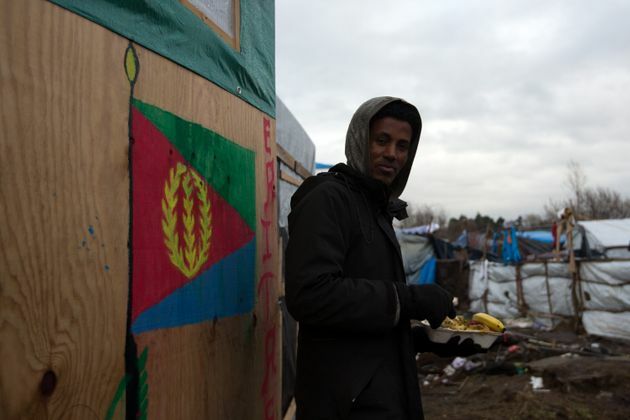 An Eritrean man eats lunch next to a shelter with the Eritrean flag in the camp known as the Jungle in Calais, France, in January 2016. Almost 10 percent of the population are refugees, according to the U.N. The U.N. estimates that about 5,000 Eritreans flee the country every month. Eritreans had been making perilous journeys to Israel and European countries for many years before the refugee crisis captured Europe’s attention last summer. The U.N. refugee agency estimated in 2014 that nearly 420,000 Eritreans -- about 6 percent of the population -- were refugees or seeking asylum. Eritreans are fleeing an authoritarian government and indefinite forced conscription. 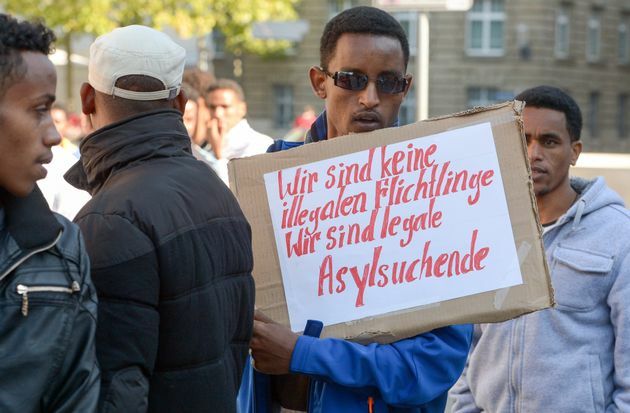 Here, a refugee from Eritrea holds a poster reading, "We are not illegal refugees - We are legal asylum-seekers," during a demonstration in Germany in October. Afwerki was once a popular rebel leader who helped win Eritrea’s independence from Ethiopia in 1993. He has ruled since, increasingly without oversight. His People's Front for Democracy and Justice is the only legal political party. The country’s constitution has never been implemented. Elections have been indefinitely postponed. U.S. officials say Afwerki has become an “unhinged dictator,” according to leaked diplomatic cables. Under his leadership, Eritreans live under a “rule of fear,” according to last year's U.N. report. The regime operates a network of spies and informants, and citizens face the threat of being locked up without charge or disappearing altogether, the report said. “When I am in Eritrea, I feel that I cannot even think because I am afraid that people can read my thoughts,” one witness told the U.N.
Every aspect of life is under regime control. U.S.-based monitoring group Freedom House designates the country as among the world's “worst of the worst” for civil liberties. The regime has banned independent media and civil organizations, and blocks international human rights organizations and U.N. investigators from entering. Only four religious traditions are officially recognized, and an estimated 3,000 people are locked up for observing other faiths. Reporters without Borders ranked Eritrea the worst country in the world for press freedom last year, below North Korea. 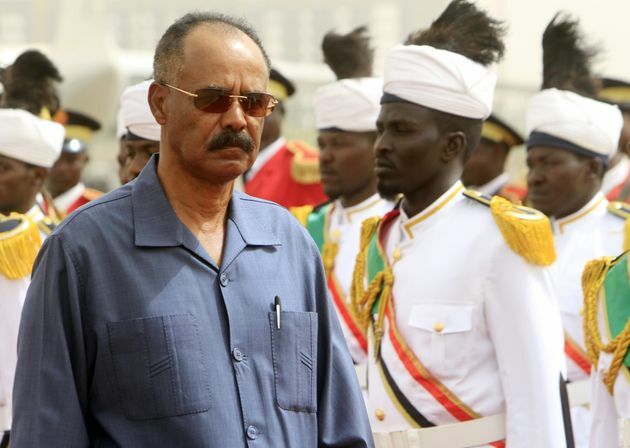 President Isaias Afwerki, pictured here last June, has ruled Eritrea since the country won independence in 1993. Officially, Eritrea has a national service for men and women when they turn 18. It lasts for 18 months. The regime says conscription is mandatory because of ongoing tensions with neighboring Ethiopia. In practice, many Eritreans are forced to stay in the military for decades -- some for life, the U.N. says. Some are forced to serve in armed forces, others in state-run industries, like schools, construction or agriculture. They are paid very little, and conscription is enforced by military roundups or the threat of imprisonment or execution. Female conscripts have reported sexual violence by military officers. Children, too, have also been forced to undergo military service. 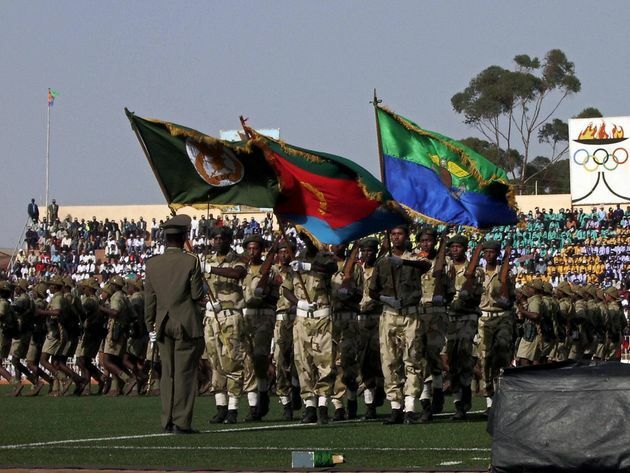 Eritrean soldiers parade during independence day celebrations in 2007. Afwerki has turned from a popular rebel leader to an "unhinged dictator," according to leaked U.S. diplomatic cables. Arrests are common, but trials are rare. Often, people just disappear. The country is described by experts as a “prison state,” with some estimates that at least 10,000 political prisoners are languishing in jail. According to Human Rights Watch, prisoners are held in dire conditions, including underground dungeons and shipping containers, without proper food, water or sanitation. 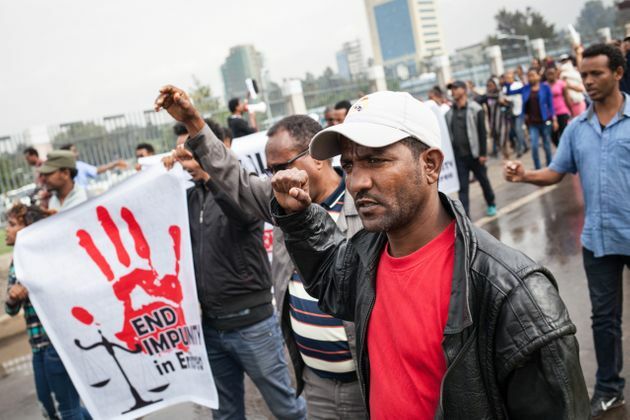 Hundreds of Eritreans demonstrate in front of the African Union headquarters in Addis Ababa after the U.N. inquiry report was published in June. The report detailed the harrowing testimonies of torture, extrajudicial execution and forced labor and conscription. 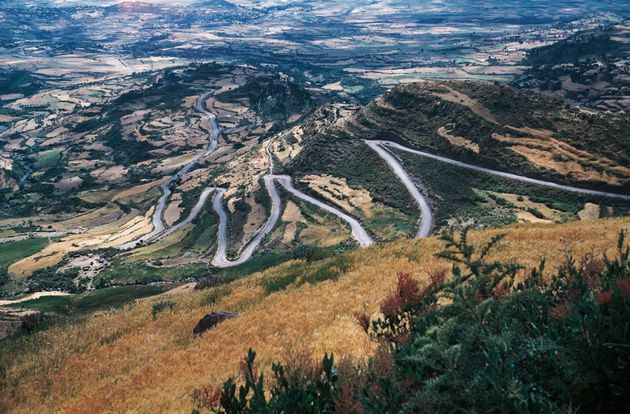 Eritrea is one of the poorest countries in the world. Its economy is dependent on agriculture, and international agencies have warned that a drought caused by the El Nino could cause food shortages. Afwerki recently denied that a crisis was afoot, even though he conceded agricultural output is down because of the regional drought. His regime also dismissed concerns of mass hunger during the last major food crisis in the region, in 2011, despite evidence to the contrary. Aid agencies and the U.N. have little access to the country to gauge the true extent of the problem. A view of the Eritrean capital Asmara. A regional drought could imperil the country's agriculture, international agencies have warned. The Eritrean regime tries to stop people from leaving the country. Fleeing while in military service is considered defection and severely punished, the U.N. says. Even if someone secures a release from military duty, they have to obtain an exit visa, at the regime’s discretion. People trying to leave the country without one are detained and guards at the Ethiopian border regularly shoot people trying to flee, according to human rights groups. Escaping Eritrea may leave family members left behind at risk of detention. When the regime’s information minister went into exile in 2013, his family was reportedlyrounded up. The government tries to enforce a 2 percent income tax on Eritreans living abroad, and some say they fear retaliation against family members back home if they don’t pay. The regime “turned Eritrea into an earthly inferno and made life insufferable for its people,” writes Andebrhan Welde Giorgis, a former Eritrean official who broke ties with the regime in 2006, in a recent book about the country. “This has rendered the country unsuitable and insecure to live in for its people and provoked mass exodus,” Giorgis wrote. Several European nations are trying to make it harder for Eritreans to make asylum claims, based on reports about improvements in the country that have been criticized by the U.N. In this photo, migrants wait on a beach in southeastern France in June. Last year, over 40,000 Eritreans fled to Europe. According to the U.N. most took the dangerous route to Italy. This usually involves traversing the deserts of Sudan and Libya before a perilous Mediterranean Sea crossing -- all at the mercy of smuggling gangs known for kidnapping, extortion and torture. Almost half of the Eritrean asylum-seekers in Europe interviewed by the Overseas Development Institute had been kidnapped for ransom along the way. Yet several European nations, including Denmark and the United Kingdom, are trying to make it harder for Eritreans to get refuge inside their borders, citing the regime’s claims that reforms are underway. The United Nations and international human rights groups have slammed these claims, saying Afwerki’s pledges are not credible without verification, and human rights organizations are still banned from the country.